Owram, D.r.. "Imperialism". The Canadian Encyclopedia, 23 May 2018, Historica Canada. https://www.thecanadianencyclopedia.ca/en/article/imperialism. Accessed 22 April 2019. 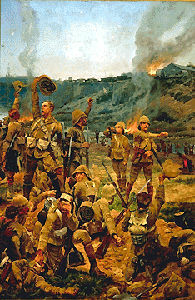 At the Battle of Paardeberg in the South African War, Canadian troops volunteered to fight for the British Empire. (courtesy The Corporation of the City of Toronto). Support for imperialism and for the British Empire was strong in much of Canada in the decades after Confederation. But gradually as the country matured, and as it made sacrifices on Britain's side in overseas wars, imperialist loyalties declined and Canadians demanded and won full autonomy within the empire. In the late 19th century various large and powerful nations entered a phase of territorial expansion often called the second great era of imperialism. Britain, France, Germany, the United States and others sought new colonies and zones of influence for commercial, military and religious reasons. This imperialism coincided with growing concerns in Canada – whose provinces were once British colonies – about the country's relationship to the already vast and powerful British Empire. Britain remained responsible, even after Confederation in 1867, for Canada's external relations. Britain also paid for Canada's national defence. Such arrangements, some of the last remaining pieces of Canada's colonial past, were increasingly unacceptable to many. Yet despite a growing awareness that Canada should become fully independent from Britain, there remained strong British loyalties among millions of Canadians, along with fears that total independence might leave Canada vulnerable to absorption or takeover by the US. When British imperialists founded the Imperial Federation League in 1884, Canadian supporters established branches. They sought a way for Canada to develop and mature politically beyond its colonial status, while at the same time remaining a part of the empire. 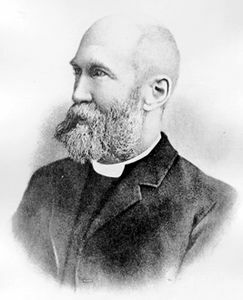 Led by George Monro Grant, George Robert Parkin, George Taylor Denison and others, the movement mixed Christian idealism and anti-Americanism with the principle that Canada (and other dominions such as Australia and New Zealand) should participate in foreign policy decisions at the imperial level. Grant was committed to imperialism and to the British Empire. (courtesy Metropolitan Toronto Reference Library/T16287). Meanwhile, pro-imperialist rhetoric late in the 19th century began to emphasize the potential of united strength. When the South African War broke out in 1899 between Britain and the Afrikaner republics of southern Africa, Canada confronted for the first time since Confederation, the question of whether it would actively help Britain by sending Canadian soldiers to fight in a British imperial war overseas. Participation was enthusiastically supported by Canadian imperialists but resisted by many others, especially French Canadians. Prime Minister Wilfrid Laurier compromised by agreeing to send a purely volunteer force. The war served notice that automatic support for the British Empire had become controversial. Membership in the empire now also implied active participation in imperial wars. From 1900 to 1914 a lively and often acrimonious debate was carried on over whether the imperial burden (of maintaining and expanding the British Empire around the globe) was equally Canada's burden. Opponents of this idea preferred autonomy from the empire and freedom from its military entanglements. When Britain went to war against Germany in 1914, Canada didn't make the conscious decision to participate – the country was automatically at war, because Canada's foreign policy decisions were made in London. The First World War brought imperialism to its most advanced stage, and also led to its collapse in Canada. Increasingly during the war, dominions such as Canada began insisting upon joint military planning and foreign policy formation, especially on matters of shared interest. 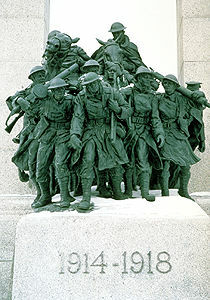 Canadian sacrifices during the First World War fueled Canada's desire to control its foreign affairs. (courtesy Parks Canada/photo by B. Morin). The sacrifice of 61,000 Canadians killed and 172,000 wounded in the war fueled demands for a greater Canadian say in foreign affairs. Prime Minister Robert Borden campaigned successfully for the right to have separate signatures, for the Canadian and dominion governments, on the Treaty of Versailles at the end of the war. During the 1920s under Prime Minister William Lyon Mackenzie King, Canada pushed hard to assert its voice in diplomacy and foreign affairs. In 1931, the British Parliament passed the Statute of Westminster, sometimes called Canada’s declaration of independence. That act ensured that Canada would now be in charge of all its decisions, both at home and abroad. When Britain again declared war against Germany in 1939, Canada first debated the matter in Parliament in Ottawa, before autonomously deciding to enter the Second World War on 10 September 1939. Canada was now a fully independent nation with control over its own foreign policy. After the war, Canada and other nations that were once part of the British Empire, maintained their historical ties to Britain – not as colonies or even self-governing dominions – but as more loosely connected, fully independent states in what became known as the Commonwealth. Carl Berger, The Sense of Power (1970). FIRST WORLD WARThe Canadian War Museum takes a look at the impact of the First World War on Canadian demands for autonomy in foreign policy. 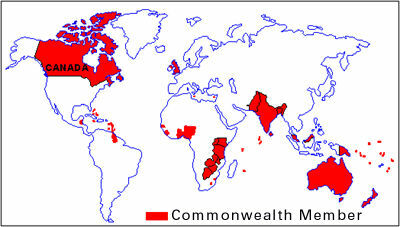 COMMON- WEALTHThe Canadian Department of Global Affairs examines the history and role of the Commonwealth.